Article first published as Euler’s Not so Organics on Blogcritics. We all like organic food, but how organic would your “organic” food be? The U.S. Department of Agriculture (USDA) allows the use of the term “organic” under Part 205 — National Organic Program. To simply state the regulations, the term organic can be used differently depending on the composition of the product in § 205.301. The phrase to look at is “organically produced ingredients”. What defines an organically produced ingredient? What if the organically produced ingredient is determined to be organic through its composition by § 205.301, which has been simplified above? This diagram should help you understand. the final % of organic material in the product decreases. *Note that organic is being defined by USDA regulations, not the scientific definition of organic. We can model the decrease in the function y = 100 × .95^x or y = 100 × e^(-.05 × x). The equations’ graphs are displayed respectively above. It is basically a negative interest model. Let’s call this the Euler’s Organics Model since we are using the natural number of e, Euler’s Number to draw the second graph. We will use the diagram further above to clarify. 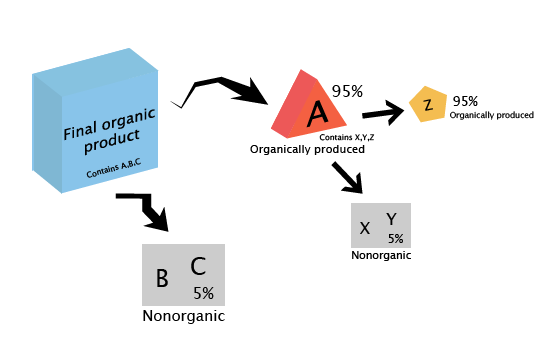 Going 1 level down, assuming that component A is only 95% organic due to X and Y components not being organic, only 90.25% of the final organic product would be organic. And so on. However, due to the nature of the functions above and reality, the final % of product that is truly organic will never reach 0% — just approach it. But wait, you say, wouldn’t the regulations, especially § 205.301 simplified above, prohibit this? The regulations refer to the “final product” being comprised of ≥X% of organically produced ingredients. This way, the measurement of weight would see component A as being the 95% organic part of the product. Component A as seen in the initial diagram may have its own subcomponents X, Y, Z. Back to the question of what defines organically produced? determination is also dependent on the percentage of the components of that ingredient. Oh no, so my food is being contaminated! Ye olde USDA hasn’t failed you yet. In the same regulation, non-organics cannot be present in 100% Organic labeled and Organic labeled foods unless they are listed under §205.606, a list of exceptions. When they are present, the label may say “Made with“. Euler’s Organics Model only applies when ingredients of a product are made up of subcomponents. It usually only goes down about 1-2 levels because sooner or later, the subcomponents are raw materials such a tomato or pepper. The tomato and pepper are 100% organic or nonorganic produce depending on where they are grown. Organic produce, raw materials, are grown according to Subpart C.
This said, you should continue feeling safe when buying organic foods since the Euler’s Organics Model only applies to certain organic labels. If you want, you can read the entire Part 205 — National Organic Program on the Electronic Code of Federal Regulations (e-CFR).